Draw a shape of Irish flag on the board and ask students to try to put green, white and orange sheets of paper in the right order. Then display the right answer and ask them to colour Irish flags. As a titbit you can tell the students that inverted colours mean that it is the flag of Ivory Coast. 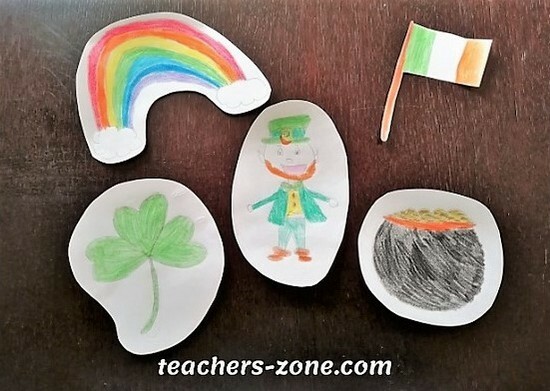 Print or draw the most common symbols of Ireland (a pot of gold, a shamrock, Leprechaun, a harp, a rainbow, and the Irish flag), name them and encourage your students to repeat the names. Then explain what they mean and ask children to make in pairs or on their own posters – a picture dictionary of Irish symbols. Put stripes of paper in colours of the rainbow on the floor and ask your students to arrange them in the right order. Then learn them the song 'In the Rainbow' to sing together. My students love this song! As a class or whole school project you can prepare a bulletin board. Ask your students to draw their hands on the sheets of papers in colours of a rainbow, sign them and write ‘Happy St. Patrick’s Day!’ on each one. Collect them in the Leprehaun hat (to find how to make a Leprehaun hat click here) and then arrange them into the rainbow on the bulletin board. Children will have a great fun looking for their ‘hands’. I would appreciate if you share these ideas with your teaching friends or leave a comment. Happy St. Patrick's Day from the Teacher's Zone!